I enjoy a rich and creamy dessert as much as the next person. Unfortunately a lot of decadent desserts are not only packed with flavor, but calories as well. I developed the following recipe for Kids Eat Right as a healthier substitute for cheesecake. Packed with fruit, protein and calcium, these trifle cups will satisfy your dessert craving and leave you feeling comfortably full. Loosely break graham crackers apart and place into food processor bowl. Pulse crackers until they become a uniform powder. Add vanilla extract, coconut oil and honey; pulse until all ingredients are evenly incorporated. The texture will be slightly moist, and ingredients will stick together slightly when pressed. Pour the graham cracker crust mixture into a separate bowl and set aside. Rinse and dry the food processor bowl. Peel one large orange; roughly peel the membrane from about six segments (or the equivalent of ¾ cup). Cut segments into thirds, and place them into the food processor. Pulse until the mixture is relatively smooth (like a slurry), but not pureed; it’s OK if there are small chunks of orange. Add yogurt and pulse just until combined. Do not over-mix. Pour the mixture into a separate bowl and place in the freezer for 20-30 minutes to create a thicker consistency. Measure out ¾ cup of blackberries and gently wash them. Place blackberries into the food processor and pulse until the mixture is relatively smooth (like a slurry), but not pureed. Add lemon juice, honey and yogurt to the slurry; pulse until combined. Pour mixture into a separate bowl, cover and refrigerate for 20-30 minutes. Rinse ½ cup strawberries, de-stem and cut them in halves. Place into the food processor and pulse until the pieces resemble small chunks (like a salsa). Add yogurt and pulse until combined. Wash all fruit under cool water. Peel kiwi and cut off hard ends; dice and place in a bowl and set aside. De-stem and dice strawberries; measure out 1 ¼ cup, place in a bowl and set aside. Peel 6-8 orange segments and cut each segment into ¼-inch pieces; measure out 1 cup, place in a bowl and set aside. Cut blackberries in half; measure out ¾ cup, place in a bowl and set aside. For one 8-ounce cup, begin by putting 2 tablespoons of graham cracker crust into the cup. Level the crust with the back of a spoon and pat down to create a more solid base. Spoon a little less than ¼ cup of the orange yogurt over the graham cracker crust. Smooth layer evenly. Place ¼ cup diced strawberries over the orange yogurt. Add 2 tablespoons of the graham cracker crust and pat down gently. Add a little less than ¼ cup of the blackberry yogurt and smooth layer evenly. Place 3 tablespoons of orange segments on top of the yogurt. Be sure they are visible on the outside of the cup! Add 2 tablespoons of graham cracker crust and pat down gently. Add a little less than ¼ cup of strawberry yogurt and smooth evenly. 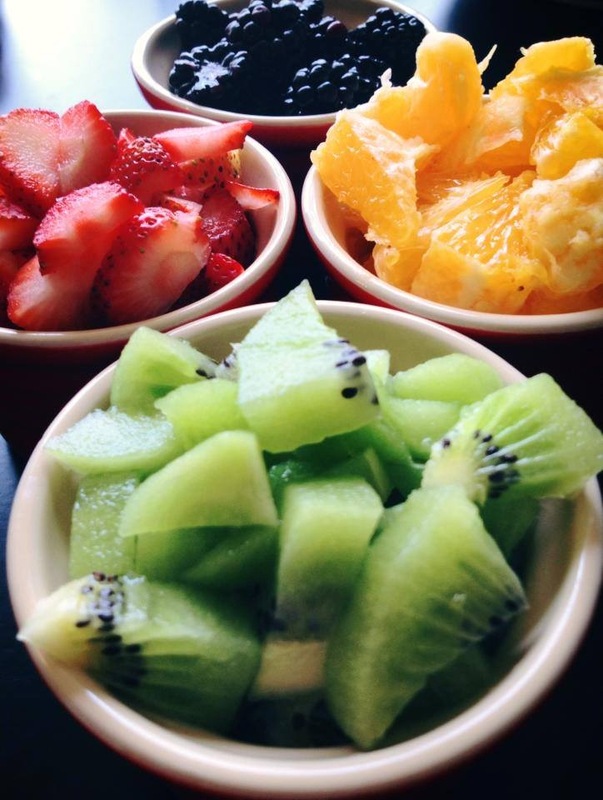 Sprinkle 1 tablespoons of kiwi and 1 tablespoons blackberries on top. Eat immediately or chill and enjoy later! The longer cheesecake cups are able to chill in the refrigerator, the thicker the yogurt will be and the better the layers will stay separated. 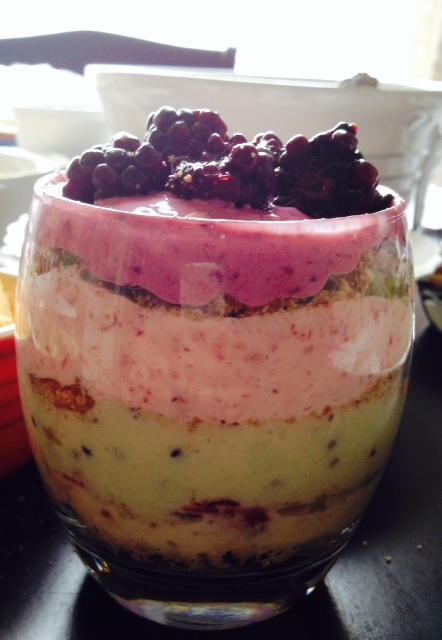 You may mix and match fruit and yogurt layers or try different fruits altogether. Some good combinations may be blueberry, raspberry and strawberry, or pomegranate, peach and pear! Make a gluten-free version of the crust by substituting pitted dates and almonds for graham crackers. Be gentle when patting down the layers, as the crust is prone to sticking to the yogurt layer.